Bingo Drop Medal Game is an eye-catching medal game in a giant gum ball machine design, features in middle with a colorful roulette drew with scores, side with 6 activity balls pump up tracks and overhead with a balls storage, and with 6 control panels for 6 to 12 players in exciting balls drop roulette game. Each control panel is built with a touch screen for two player game play, that appears virtual ball rolls in and exciting bingo game play. And each player gets two bet chances to win more tokens. For the first bet, player need to aim the roulette scores holes and press push button released balls drop down correctly to the score holes to win the second bet for final chance in highly strategic bingo game to win more tokens. Each control panel is built with a touch screen for two player game play, that appears virtual ball rolls in and exciting bingo game play. And each player gets two bet chances to win more tokens. 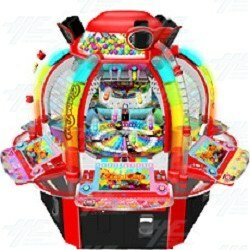 For the first bet, player need to aim the roulette scores holes and press push button released balls drop down correctly to the score holes to win the second bet for final chance in highly strategic bingo game to win more tokens.